I have terribly dry hands to begin with – and the winter months make it even worse. After continuous ranting to the boy about the status of my hands he picked some Almond Hand & Nail Cream for me at The Body Shop. This effective daily hand cream cares for nails as well as hands and contains two manicurist’s essentials: sweet almond oil and panthenol. Moisturizing Conditions nails Sweet almond scent. This is a great hand lotion! I have been carrying it around in my purse and apply it whenever I wash my hands or they feel dry. This lotion is great for day use as it’s not overly thick or greasy. For days where my hands get crazy dry I still need to do a more intense moisturizing treatment. My nails and hands are very happy since I have been using this. 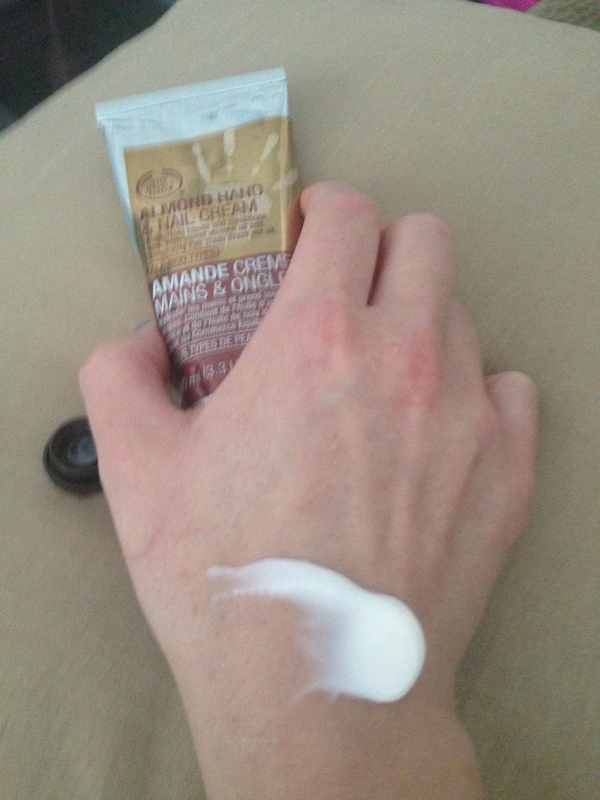 This entry was posted in Beauty and tagged body shop, dry skin, hand and nail cream, hands, lotion, moisture, moisturize, nails, Skin, skincare by maldham. Bookmark the permalink. Haven’t tried this but have used the hemp hand cream (and don’t like it that much). I find TBS hand products to be okay but like you mentioned when hands are crazy dry, I need something more intense. what do you use when you need something that provides more hydration? Sugar with oil (sometimes olive oil to be honest). Scrub, rinse, add whatever moisturizer I have for hands and sleep in light cotton gloves. It works but is a bit of a pain.